Are you an artist or craftsman? Do you have allergies, travel often? Do you often visit doctors' offices or hospitals? the Totobobo Mask is for you. Folks who live in Salt Lake City, this mask will protect you from the pollution!! I'm so sorry everybody. It's been a rough year for me. I've not been well and then I lost my big brother. I just haven't been able to get more, but I do plan to continue selling these fabulous masks. I'll keep you updated. Again, my sincere apologies. It will take about 3 weeks to get a new shipment, so if you'd like to get on the wait list, please email me at paulaford9660@aol.com. P.S. I have plenty of filters. the ear loop straps, so they are snug. NO MORE BAD HAIR DAYS!! I'll take new pictures of me wearing it soon. From now on I will be shipping all masks and filters by USPS Priority Mail. The new cost will be $6.00 total, no matter how many masks and filters you purchase. When you buy a mask and filters, I will refund the shipping of the filters. USPS Priority Flat Rate Mail is automatically insured and has tracking. For my Canadian friends, shipping rates have gone down!!! Shipping is now $6.00 for masks, and $4.00 for filters. Unfortunately, there is no tracking for items going to Canada unless you want to pay about $20. Be assured though, I have never had a lost shipment to Canada...never. within the Continental United States and Canada. 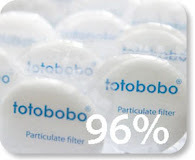 When you purchase a Totobobo mask, it comes with 4 sets of 96% filters....one set is already installed in the mask, plus 3 extra sets. When you purchase extra filters, you will receive 5 sets of 96% filters, so if you order 2, for example, you will receive 10 sets of extra filters. Pollution, forest fires, gardening, cycling, arts and crafts....just to mention a few. Anyone who needs protection for their lungs should use the Totobobo Mask. It is the finest mask made and it's comfortable and doesn't fog your glasses. I DO NOT SHIP TO UNCONFIRMED ADDRESSES. The mask can be shaped to follow the unique shape of your unique nose bridge. Totobobo "Heat mold" feature does this. Be gentle with the straps!! Be gentle and don't force while opening the filter compartment!!! Please join me on Facebook!! Please follow to get updates!